Spanish palaeontologists have uncovered a new dinosaur with what may be the earliest evidence of feather follicles. The researchers, whose findings are published in Nature, located the fossils near Cuenca, central Spain. They named the reptile Concavenator corcovatus, meaning "meat eater from Cuenca with a hump". 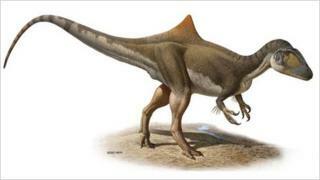 The type of dinosaur that was found is known as a theropod. Theropods are mainly known from the ancient southern landmass, Gondwana. Over time, Gondwana and other ancient landmasses broke up, forming the continents we see today. Image caption Five bumps were found on the fossil arm bones (top) whereas modern birds such as the turkey vulture (bottom) have eight to 10. Recently a team from Cambridge, UK, and the US showed that the theropods may have originated in the Northern landmass, Laurasia. Theropods are a very important group of dinosaurs because it is from this group that birds are known to originate. Most theropods, like the one found in Spain, are meat-eaters, though some were omnivores. "They are a very important group of dinosaurs because within this group there are the birds. This world would not be the same without birds. Birds are really a kind of specialised winged and flying theropod dinosaur," said Professor Jose Sanz of the Universidad Autonoma de Madrid. The dinosaur's unusual skeleton included a hump over the ilium - where the hind legs join the spine - and around five bumps on the forearm. These bumps closely resemble the attachment points for feathers found in modern birds, and might present evidence that feathers are much older, in evolutionary terms, than previously thought. The fossil dates from a time period when feathers or feather-like appendages have been seen, but the dinosaur is from a branch of the evolutionary tree that is more primitive. Although these bumps have been seen in dinosaurs before - including Velociraptor, it is interesting and new to find this characteristic in a dinosaur that is so far removed from either birds or previous known feathered dinosaurs. The bumps are very similar to those in present-day birds, with just two differences. There are fewer bumps in the Concavenator and they are not in such a regular arrangement. The team interpret these differences in evolutionary terms. They suggest that over evolutionary time the bumps could have evolved into the feather attachments that are found in modern birds. The hump found on the dinosaur's spine is more of a mystery, however. Humps are common in dinosaurs, and can be used for heat regulation - when they might look like a kind of sail - for display, or for food storage. The team cannot work out what this hump might be for, though. It is probably not for heat regulation, since normally a hump of this type would need an extensive blood supply, and there would be evidence within the surrounding bone - the team did not find this. Also, most previous dinosaur humps have been found around the shoulders or the centre of the back - this hump is further towards the tail.